The Masters Trecime Alu Trail-running poles were designed for those wanting lightweight super collapsible poles for hiking, trekking, and trail-running. The 5-section shaft (o 16-14-12mm x 3 pc) is made using 7075 aluminum alloy to provide a lightweight pole with maximum performance. The Masters "push/pull" system allows for quick deployment, accurate length adjustment, and easy storage. When collapsed these foldable poles measure only 35cm in length and have a maximum in-use length of 130cm. The lightweight Falco foam grip is comfortable and includes an adjustable strap with quick-drying material against your wrist. The long pole tip includes a lightweight 7075 aluminum spike and a 50mm screw-on basket for optimal support in any conditions from rock to ice. 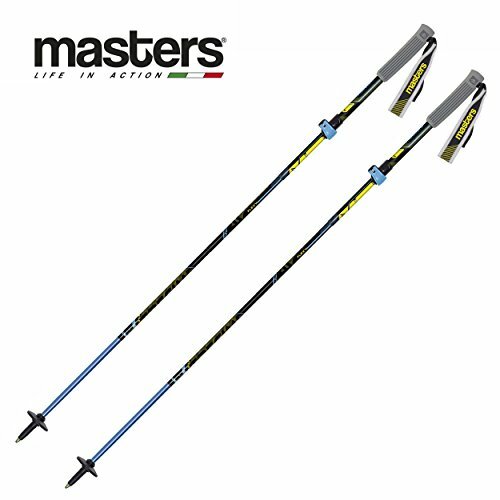 At only 420 gr per pair the Masters Trecime Alu poles won't weigh you down on your next adventure. Mesh storage bag included. Made in Italy!